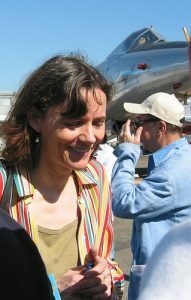 n January 5, 2005, Florence Aubenas, a French female war correspondent for French daily Libération, was held hostage in Iraq with her Iraqi translator, Hussein Hanun. Their captivity and release on June 11, 2005, was the focus of media attention as the French government worked as quietly as possible to secure her release. But what isn’t as well known are the people who may have played a vital role in her freedom. The French government, desperate to appeal to her kidnappers, sought out the help of one man in particular. A contingent of diplomats and officials delivered a letter and request for help to Abdallah bin Bayyah. Bin Bayyah released his own public statement and sent a message to the captors. He also joined the dozens of media organizations and government officials in calling for her freedom. A short while later, Aubenas and Hanun were released. 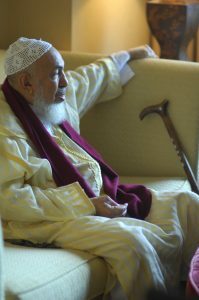 Sitting on a bright yellow couch, bin Bayyah wears a Moroccan jalabiya, a long robe traditionally worn by men in the Middle East. He has a long, white beard that gently hides his curved neck, a brown cane and he is slightly hunched over. His face has the pleasantness of a pensive grandfather gently welcoming any question that anyone asks of him. When he is asked a question, he sits silently for a few minutes, one hand on his lap, the other resting on top of his cane. He looks at the floor. Taking a deep breath, he then responds in a soft voice. When he speaks, his words are measured and slow, thoughtful and deep. Those in the room, regardless of the number of people present, lean in and hold their breath, listening to every word he says. He addresses a broad range of people, from the young, Western Muslim looking to further his own practice of the faith, to the world-renowned politician. Perhaps one reason why he can address such a diversegroup of people ranging in age, race and background, and why they willingly listen to him, is because of his charisma and unique way of explaining complicated subjects. Bin Bayyah is a rare personality in our world today. 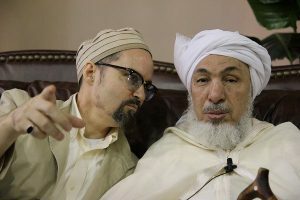 Often seen donning a white head wrap, bin Bayyah delicately blends the modern with the traditional when discussing Islamic thought and jurisprudence. He speaks to the heart and to the mind. He freely weaves spirituality with modern rationality. Not many religious leaders can do this with such ease. But bin Bayyah can. Bin Bayyah was born 78 years ago in East Mauritania, and hails from a long line of Islamic scholars. As early as the age of 12, he set out to start his education in Islamic jurisprudence. His father Cheikhna Mahfudh was also one of the most revered Western African scholars of Islam of his time. Under his father’s tutelage, bin Bayyah completed a rigorous Arabic language curriculum, mastering the most advanced level in grammar and rhetoric, as well as pre-Islamic Arab poetry. When he was 20, he accompanied a group of seasoned scholars to Tunisia for training in modern court systems that were to be implemented in Mauritania. Today, his white facial hair partially hides wrinkles of wisdom that map his olive skin underneath. Ethnically, bin Bayyah is Arab and Mauritanian. Perhaps this diversity helps him gain respect from various audiences. Having served as a minister for the Mauritanian ministry of Justice, he has shown that even the religious elite can be an exemplar of modern justice. Previously, he was the minister of education and national guidance, improving the country’s educational system and engaging youth groups by stopping Mauritania from being infiltrated by communist thought. These efforts continued until he became the secretary general of the governing party and later the vice president of Mauritania, demonstrating his ability to walk the political tightrope in a country fraught with religious and political infighting. His mastery of French was an asset in his study of European thought and the history of ideas, up to and including post-modern discourse. He is rare among contemporary Muslim scholars in his familiarity of modern philosophers and social theorists, such as Jurgen Habermas, Michel Foucault and other luminaries of the Western tradition. All this demonstrated knowledge became the backdrop of how he helped lead his country. But bin Bayyah’s highest accomplishments may not be all his high-profile positions or the numerous medals and honors he has received over the years. Bin Bayyah, quite simply, is a beloved teacher by all who study with him. Starting out as a student in the deserts of Mauritania, bin Bayyah has traveled the world in search of knowledge, and thereby, imparting that knowledge to those willing to listen. His messages of peace have not gone unheard, and with modern technology broadcasting his talks and messages throughout the globe, this religious scholar has gained quite a following. He regularly appears on Al Jazeera and Al Arabiya news networks, with an audience of 35 million viewers. He has gained the respect of many people. He also has taught many people, including the renowned American convert to Islam, Hamza Yusuf. Today, bin Bayyah spends most of his time teaching Islamic jurisprudence at King Abdul Aziz University in Saudi Arabia, as well as focusing on peace and multifaith dialogue, initiatives on behalf of his organization, the Global Center for Renewal and Guidance, which also conducts training for scholars on Islamic jurisprudence for contemporary times. Perhaps one of his many brilliant achievements occurred in Mardin, Turkey at a conference organized by his organization in 2010, where he challenged the theology of al-Qaida by identifying a typographical mistake in a fatwa used consistently by al-Qaida as supporting evidence to legitimize their grotesque ideology and acts of terrorism. His response was documented in a report titled “Challenging the al-Qaida Narrative: The New Mardin Declaration.” The Declaration is considered a threat to extremist ideologies; it has been attacked three times by various spokesmen for al-Qaida and its affiliates, and Anwar Al-Awlaki wrote a response to it, all mentioning Shaykh Abdallah bin Bayyah by name and critiquing the Declaration. Before the error was introduced in 1909, the original fatwa supported evidence for Muslims to live in a manner of peaceful co-existence through the abode of covenance. The reason this new declaration headed by Shaykh bin Bayyah was significant is because Osama bin Laden quoted the incorrect version of Ibn Taymiyya’s “Mardin fatwa” repeatedly in his calls for Muslims to overthrow the Saudi monarchy and wage a jihad against the United States. The mistake highlighted by bin Bayyah proves the inability and lack of authority that jihadist groups have in issuing fatwas. But like many high-profile contemporary Muslim leaders, bin Bayyah is not without his detractors, particularly in the United States. Conservatives have claimed that he supports terrorism and terror groups, pointing to his leadership in the International Union of Muslim Scholars, which they claim is tied to the Muslim Brotherhood and, in 2004, allowed for the killing of U.S. soldiers in Iraq. This was alleged, despite the fact that the Muslim Brotherhood had been democratically elected in Egypt and was in dialogue with the United States. However, such negative publicity did not stop the White House from inviting bin Bayyah to a meeting with President Barack Obama’s national security staff in June 2013. His mission was to ask for more support for Syrian rebels against the oppressive regime of Bashar Al Assad. Days after his visit, the White House announced a plan to arm Syrian rebels. Perhaps it is bin Bayyah’s ability to humbly listen to others that attracts people to listen to him. It may be that this skill alone allows him to reach and be respected by the diversity of opinions, schools of thought and sects, ranging from the Sufi to the Wahhabi to the Shiite to the Sunni. And perhaps this is why bin Bayyah is someone whom American policymakers should pay closer attention to. Bin Bayyah, arguably, has the ear and attention of virtually every American Muslim scholar and leader and evidence shows the respect and love of countless American Muslims who line up eagerly waiting to listen to him or be in his presence. Bin Bayyah is in the minority among the Muslim scholarship community, and recognition of his leadership and authoritative voice is evidential through his participation at conferences and forums, whether Shia or the different schools of thought among Sunnis. Bin Bayyah is respected by all these schools of thought. In May 2013, bin Bayyah traveled to the United States. He taught classes on jurisprudence; was invited to speak at a mosque in Northern Virginia where the president of the Islamic Society of North America — the largest Muslim organization in the United States — also serves as the imam, and spoke of the need for American Muslims to be civically active in America and peacefully engage in policy; sat with Bill Gates to discuss polio eradication in Africa; and attended a security summit at The White House. 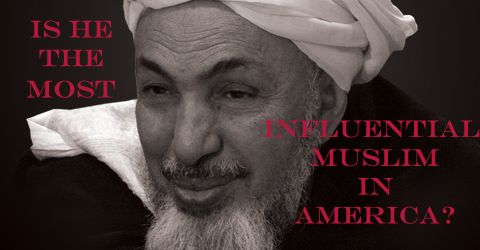 Although bin Bayyah is not a household name in America, yet, he has the potential to gain a higher profile in the U.S. and change the national dialogue about Muslims and Islam in America. His dynamic character and unique way of parlaying his message of peace that pervades all sects, races, cultures and creeds can resonate with an American public that has for far too long been conditioned to fear Islam and Muslims. More importantly, bin Bayyah serves his own Islamic community as a wise role model, particularly for Muslim youth, who may too easily be swayed by the glitz and glamour of extremist ideologies.